The Tuscany Spout is similar to the Venetian, but has a different spout opening. Every bit as glamorous as the centuries-old fountains in Italy, the Tuscany Spout is the ultimate choice to replicate a Tuscan feel in any fountain, pool or spa design. The spout boasts a thick body and circular head to stay true to this classic Tuscan look. It is crafted from 100% brass and available in all of our metal finishes but looks especially striking in antique brass, oil-rubbed bronze or copper. The price includes Dura coating. Italian Spouts are shown in Antique Brass as their standard finish, and for the most part you can look at any of the other Italian Spouts to get an idea of the color. Choosing a finish via a photo can be a little tricky, our expert sales people will contact you before your order is produced to ensure your chosen finish and will offer suggestions as necessary. 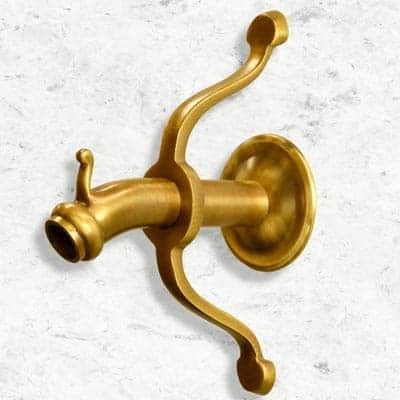 Antique Brass, most popular for Italian Spouts, offering enough shine to be considered ornamental outside, but not a full shine requiring constant maintenance. Oil Rubbed Bronze, a dark brown patina, will show hints of brown in daylight, otherwise will appear black. Almost Black, our darkest patina, will appear black in most circumstances, even in full sun. Antique Pewter, product is Nickel plated and negative highlights of black given to darken the appearance. Natural Aging, product has no finish, has a soft tumble finish and will look generally old. There is no seal coat, so the product will verde patina naturally or accelerated with your assistance. Special Finish, we offer a complete range of finish options, if you want something special, please contact us. Price will vary depending on the service you desire.